Your donation will make a real difference and help save babies’ lives. 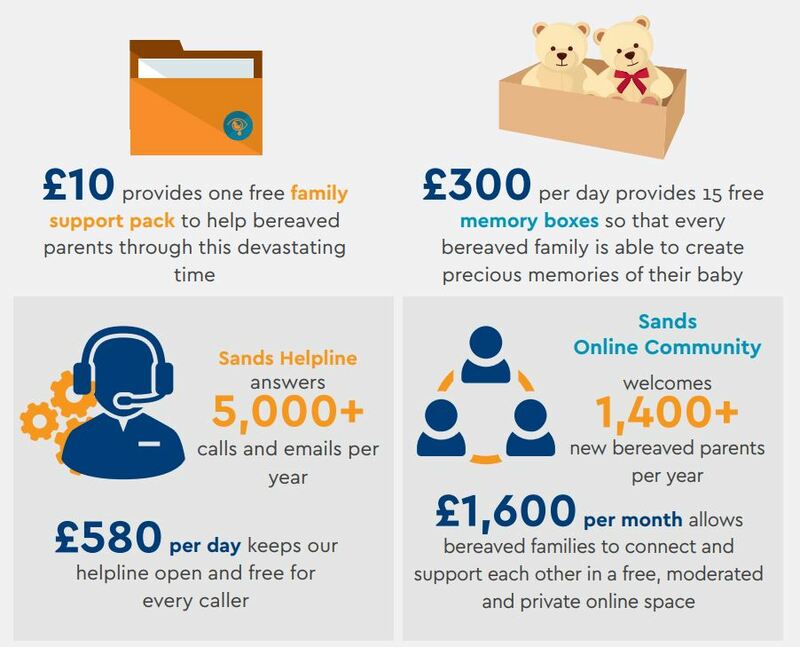 Sands supports anyone affected by the death of a baby, works to improve bereavement care and promotes research to reduce the loss of babies’ lives. £10 - provides one free family support pack to help bereaved parents through this devastating time. £20 - provides one free memory box so that every bereaved family is able to create precious memories of their baby. If you have any questions about making a donation to Sands, please contact Ana or Mike on 0203 908 5525 or supportercare@sands.org.uk who will be happy to help. There are hundreds of enjoyable ways you can choose to raise money, from fun runs to Marathons, from sponsored baking to attempts at record breaking. Our fundraising team is always available to provide help and advice on how to make the most of your efforts, and to support you.